“Compassion is the fragrance of love. Love is the flower. How do you know there is love? There is compassion.” These words were shared by the survivor of the Carlton fire in Washington as he received his new home. [i] How do people know the love of Christ? They experience the compassion of Christ through his disciples. Compassion has been a hallmark of the Methodist people since our beginning with John Wesley. What does it mean to be a United Methodist? In part, we are a people who are dedicated to making Christ’s love tangible among each other and out into the community beyond our churches. We are a people who seek to spread the fragrance of love across our communities both near and far. After attending the Special Session of General Conference, I was heart-broken and deeply discouraged. God, as God so often does, provided for me just when I needed it most. I got home from the General Conference demoralized and grieving. I had a day to repack and then headed off to Puerto Peñasco, Mexico with 67 United Methodists from across our conference. These Desert Southwest Conference United Methodists ranged in age from 6 to 90 from eleven congregations joining together from across our conference to spread the fragrance of Christ’s love to three low income families in Mexico. We partnered with 1Mission to build homes for these families. At 1Mission, low income families can earn a home by volunteering 400 hours of service. 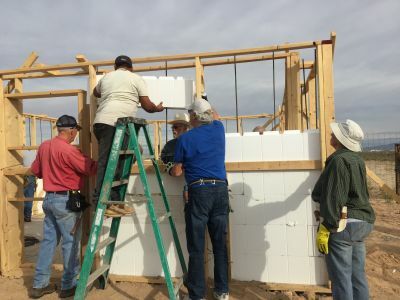 They learn the joy of serving others and then join with us to build their home. They serve by teaching each other skills. One couple shared their gardening skills by teaching fellow families at 1Mission how to grow vegetables and fruits. They shared a part of the lot of their new home for a community garden. Another husband in one of the families did electrical work so he taught other families how to do wiring. Other families help cook and serve meals to the teams or lead children’s ministries or take blood pressures of their neighbors or any number of different ministries of compassion and community development. Working with other United Methodists who demonstrated through their hard work the compassion of Christ was a healing ointment on my battered soul. It reminded me of who we are and who we continue to be, people on a journey to become as Christ-like as we can become. There is a lot of uncertainty about our future and that path will unfold in its own time. What I know about today is that we continue to spread the fragrance of love, compassion, in so many different ways. Randy Bowman, our conference treasurer, wrote a wonderful article in this newsletter called Hope for Ministry Together that talks about the ways our apportioned giving supports ministry together. West and East District churches are opening their doors and their hearts to the flood of asylum seekers being released into the Phoenix area. And other United Methodist Churches are stepping up to offer their help and support in many different ways. (Click here to review my district article about some of them from March 12, 2019.) Every church I visit has different ways and places they spread the fragrance of love. As we go through this time of uncertainty and transitions, let’s not forget the essence of who we are—we are disciples of Christ called to live personal and social holiness, living Christ’s compassion at all levels of our lives and our society. [i] Video Rising from the Ashes: Home dedication ceremony, August 23, 2015. https://www.youtube.com/watch?v=ceAHGrtomZk 5:06 minutes into video.